ELA.L.5.1: Demonstrate command of the conventions of standard English grammar and usage when writing or speaking. ELA.L.5.2: Demonstrate command of the conventions of standard English capitalization, punctuation, and spelling when writing. ELA.L.5.3: Use knowledge of language and its conventions when writing, speaking, reading, or listening. ELA.L.5.6: Acquire and use accurately grade-appropriate general academic and domain-specific words and phrases, including those that signal contrast, addition, and other logical relationships (e.g., however, although, nevertheless, similarly, moreover, in addition). 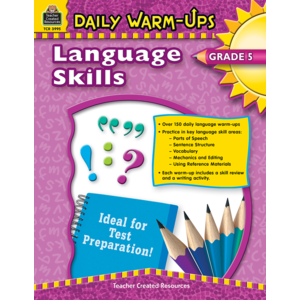 ELA.L.5.4: Determine or clarify the meaning of unknown and multiple-meaning words and phrases based on grade 5 reading and content, choosing flexibly from a range of strategies. ELA.L.5.5: Demonstrate understanding of figurative language, word relationships, and nuances in word meanings.